Activities in Valdarno – If you don’t know this territory yet, we’d like to suggest you some nice activities you can choose in this area. In the area of Castelfranco Pian di Sco we have found many valid reasons to know our destination, from sport activities to wine tasting tours or cooking lessons and much more. Villa Valentini offers during the summer season the use of the swimming pool and the well-equipped tennis court (rackets and balls at disposal). The village of Pian di Sco is 3 km away and offers a good choice of restaurants-pizzerias, bars, ice-cream shops and supermarket. 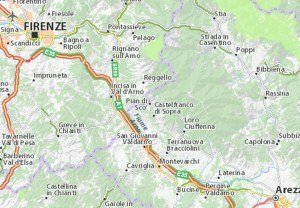 We suggest you to arrive by car so to move around freely around Tuscany but it is also possibile to book the transfer service from/ to the airport or train station and in Figline Valdarno (10 km away) there is the nearest car rental (Hertz). If you want to visit Florence, you can reach the Figline Valdarno Train station (7 km away), park free your car and catch a train (many trips during the day and it takes 30 minutes to Florence Santa Maria Novella).